At the dawn of the city, the Roman Forum was merely a swampy valley, lying between the slopes of the Palatine and Capitoline hills, crossed by a stream, the Velabrum, and criss-crossed by marshes. The inhabitants of the hut villages on the tops of the hills used the valley below them mainly as a burial ground: a sector of the prehistoric necropolis (Ninth-Eighth century B.C. ), with trench tombs and well tombs, has been identified and excavated in the vicinity of the temple of Antonino and Faustina. It was only during the reigning dynasty of the Tarquinii, at the start of the Sixth century B.C., that the work that was to form the the basis of the valley's subsequent fortune as centre of the city began: the Etruscan kings reclaimed the marshland, channelling the waters of the Velabrum into the city's oldest drain, the Cloaca Maxima, then carrying out flooring works on the square and several other operations, that were to make this area the political, religious and administrative centre of Rome throughout the Republican period and all the way to the start of the Imperial period, when the old Forum, now overflowing with temples, basilicas, public monuments and private buildings, and with no further space left to build on, was supplanted by the Imperial Forum complex. After this, we will walk up the valley of the Roman Forum to visit the Palatine Hill. Approximately 54 metres in height, it overlooks the Roman Forum on one side and the Circus Maximum on the other. Legend indicates that Rome had its origins on the Palatine Hill. Recent excavations have actually shown that the first settlements on the hill date back to the Eleventh-Tenth century B.C. : a village of huts covering just a few hectares, surrounded by the Velabrum marshes, from which it was possible to control the Tiber river below. This first collection of huts is the "Roma quadrata" (Square Rome), so named by ancient historians due to the irregular rhomboid shape of the area covered: its boundaries were the Great Altar of Hercules in the Forum Boarium, the Altar of Consus in the Circus Maximum, the Curiae Veteres at the foot of the Palatine Hill overlooking the Velian ridge and the Sanctuary of the Lares in the Forum. According to classical mythology, the Palatine hill, or rather the marshy area that connected the Palatine to the Capitoline, known as the Velabrum, was where Romulus and Remus were found by theShe-wolf who suckled them in the "Lupercal", which has only recently been located (2007) in the House of Augustus. According to the legend, the shepherd Faustulus found the divine twins (sons of Rhea Silvia and the god Mars) and raised them with the help of his wife Acca Larentia. When Romulus, on becoming an adult, decided to found a new city, he selected the Palatine hill, in opposition to his defeated brother Remus, who wanted to found the new city on the Aventine hill. Roman emperors from Augustus onwards built their official residences on the Palatine. The remains of the House of Augustus and the sumptuous palaces of Tiberius and the Flavian dynasty, with the Stadium for private entertainments offered by the emperors, can still be seen and can be visited in full. Descending from the Palatine we enter the Amphitheatrum Flavium, or Colosseum, named after the nearby colossal statue of Nero clothed as Helios. It was inaugurated for the first time in 79 A.D. and then again in 80 A.D.; for the second inauguration the games lasted 100 days, and 5000 wild beasts were killed! 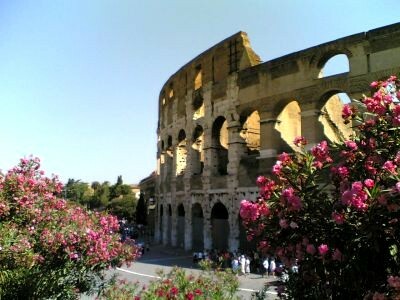 The history of the Colosseum was a succession of great events and temporary pauses in activity, as a consequence of earthquakes, or fires that damaged the structure, but also due to the moods of imperial politics which at times encouraged and at others limited violent, blood-thirsty spectacles. We will re-live this monument's five centuries of history and the emotions felt by spectators in times past, walking through the galleries beneath the stands capable of housing as many as 50000 spectators, and then looking out over the huge arena, which saw furious combats and the death of thousands of gladiators and condemned criminals, to the shouts of a people drunk with blood-lust. Duration approximately 3 h, with a 15' pause before entering the Colosseum. Meet in front of the entrance to the Roman Forum in Largo della Salara Vecchia 6 (this is along Via dei Fori Imperiali, where it joins Via Cavour). Cost of participation: adults €59, young people under 18 €49, children under 6 years of age free. For information and bookings, please call 0692939974; 0766840578; mobile 3281640180; or write to segreteria@romoloeremo.com, leaving the necessary details for us to contact you; payment on site to the guide, who will carry a ROMOLO E REMO sign. N.B. due to the fact that entrance is free we will not be able to purchase tickets on-line in advance, so it will not be possible to avoid any queues. It will NOT be possible to avoid passing through the metal detectors.